How Big is Your Company’s Digital Shadow? 2012 will see organisations and their employees exposing more information online than ever before, be that through social media or through the technologies used by an organisation. They may perceive this information to be benign, however many have unintentionally and unknowingly exposed themselves to compromise by a cyber attack or may have leaked damaging or confidential information. Hackers are increasingly researching their target organisations and their employees before making focused, targeted attacks. This presentation examines how companies' digital shadows are growing, and puts forward steps organisations can adopt to help get this information sprawl under control. James Chappell is CTO for managed security service firm, Digital Shadows. James, builds on a technical infosec consulting career of 12 years looking at the security of large private sector and government organisations. During this time he became fascinated by the growth of crime and fraud in computer networks, with a particular focus on effective ways of measuring of managing the big picture of information security for large public and private sector organisations. 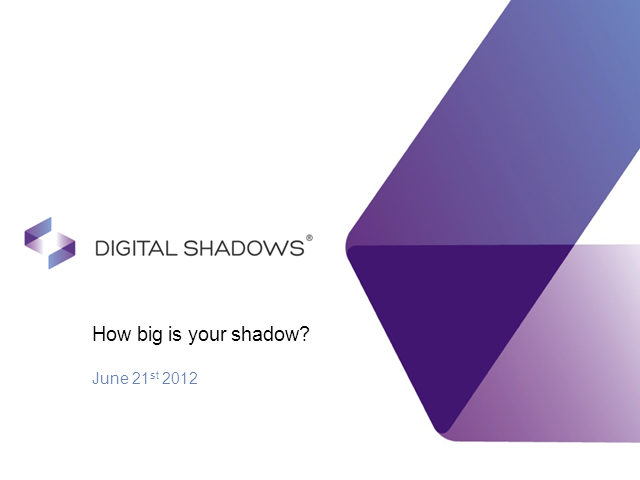 Title: How Big is Your Company’s Digital Shadow?